Passover starts tonight, and the holiday always makes me reflect on history: Jewish history and my own family history. When I first started on this path about five years ago, I never anticipated how much there was to learn. I didn’t have an appreciation for what my own ancestors had experienced or how integrated my own family’s history has been with Jewish history—in Europe and in the US. Nor did I understand how interconnected we all are in so many ways and what a truly small world it is. One of the great benefits of family history research is finding cousins you never knew about and making connections. I have been so fortunate in that regard. I have connected with cousins as close as second cousins and as distant as fifth cousins, cousins who live close by to where I live and cousins who live all over the world, cousins who are in their nineties and cousins who are in their twenties. Some of these cousins found me, some I found through my research. It’s always a bit of a shot in the dark when you reach out to a stranger and tell them you are somehow related to him or her. Sometimes you get no response, sometimes a skeptical response, and sometimes a truly enthusiastic response. This post is about several truly warm and enthusiastic responses, and they relate to my Katz cousins from Oklahoma. So a bit of background. My Katz cousins are all descended as I am from Scholem Katzenstein and Breine Blumenfeld from Jesberg, Germany, my 3x-great-grandparents. While I am descended from their son Gerson Katzenstein, my Katz cousins are descended from their daughter Rahel Katzenstein and her husband Jacob Katz. As I wrote previously, Rahel and Jacob had six children. Thus far, I have written about Samuel and a little bit about Abraham, both of whom came to the US in the 19th century as young men. Ancestry.com. Hesse, Germany, Deaths, 1851-1955 [database on-line]. Provo, UT, USA: Ancestry.com Operations, Inc., 2016. Original data: Sterberegister und Namensverzeichnisse. Hessisches Hauptstaatsarchiv, Wiesbaden, Deutschland. I knew from the Ancestry transcription of the record that Meier had died on October 30, 1925, in Jesberg, but I could not decipher the script to read any of the other details. I posted the death record on the German Genealogy group on Facebook, and the kind people there provided me with a translation that included the information that the informant was a man named Karl Katz who had been residing at the same address as Meier. 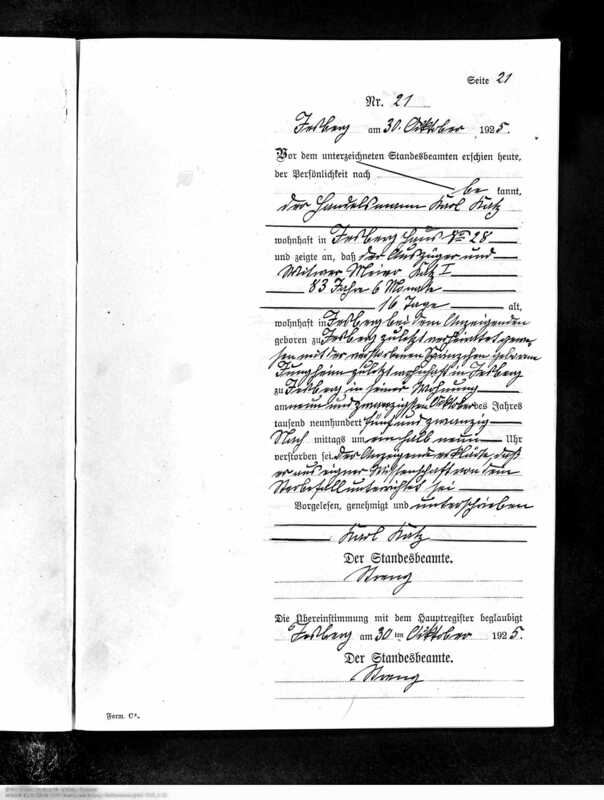 Before the undersigning registrar appeared today the personally known merchant [Handelsmann] Karl Katz, residing at Jesberg Haus No. 28, and declared that the retired farmer [Auszüger] and widower [Witwer] Meier Katz I., 83 years 6 months 16 days old, residing at Jesberg with the delaring person, born at Jesberg, has been married to the deceased Sprinzchen née Jungheim lastly residing at Jesberg, died at Jesberg at his domicile on 29. October 1925 8:30 p.m. I thought that Karl might be Meier’s son and decided to search for a Karl Katz born in Jesberg, expecting not to find anything or perhaps at most a record from Germany. 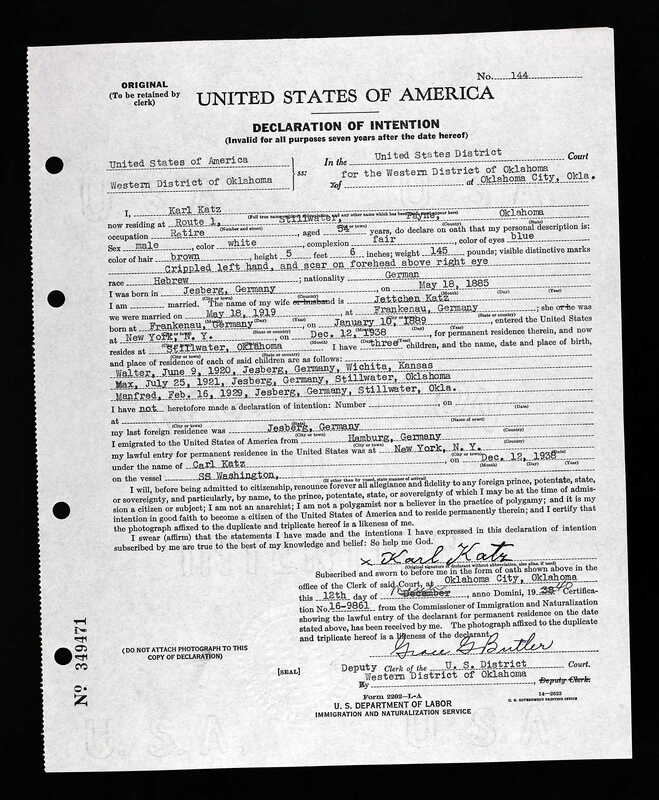 But instead I found U.S. naturalization papers for a Karl Katz who had arrived in the US in 1938 and settled in Stillwater, Oklahoma. I immediately thought this could not be a coincidence—that somehow this Karl Katz had to be related to my other Katz relatives in Oklahoma. If this Karl Katz was the son of Meier Katz, he was the nephew of Abraham and Samuel Katz. It made sense that in 1938, escaping from Nazi Germany, he would have come to the place where his father’s brothers were living. As I did more research, I found the ship manifest for Karl along with his wife and a son. When I checked the second page, expecting to see that he was going to his uncle Abraham Katz in Oklahoma, I was surprised to see that instead it said he was going to his brother, Jacob Katz, in Stillwater, Oklahoma. It seemed I had found another son of Meier Katz! 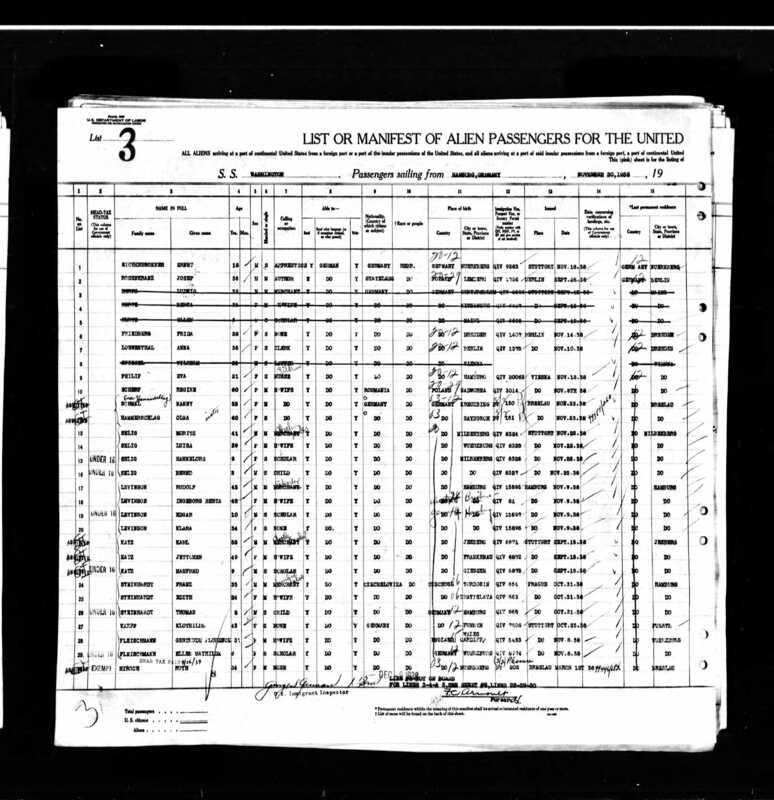 Original data: Passenger Lists of Vessels Arriving at New York, New York, 1820-1897. Microfilm Publication M237, 675 rolls. NAI: 6256867. Records of the U.S. Customs Service, Record Group 36. National Archives at Washington, D.C. Passenger and Crew Lists of Vessels Arriving at New York, New York, 1897-1957. Microfilm Publication T715, 8892 rolls. NAI: 300346. 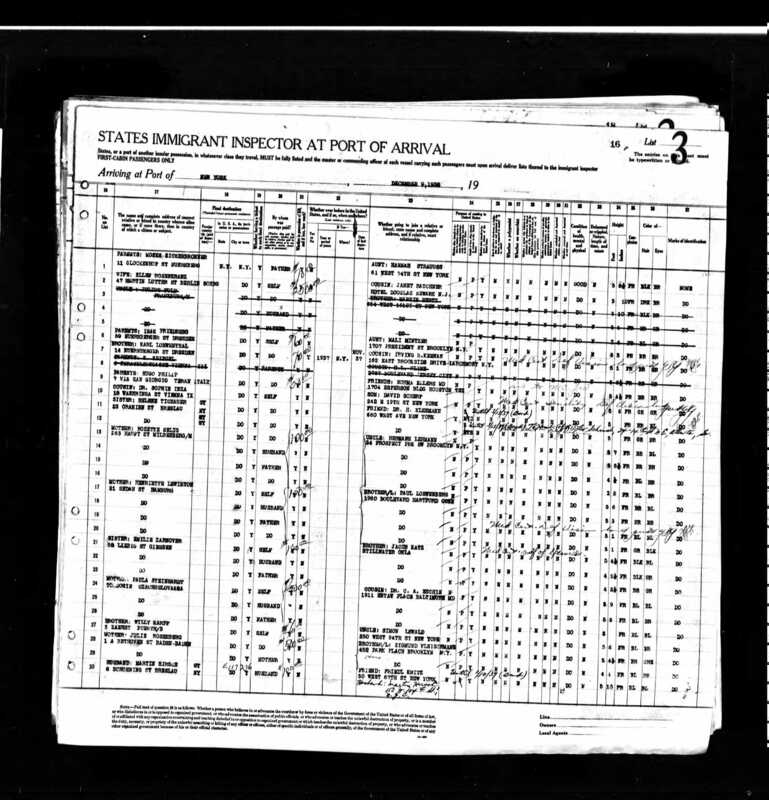 Records of the Immigration and Naturalization Service; National Archives at Washington, D.C. I was quite excited and then started researching Jacob Katz, only to learn that he had been in the US since about 1886 and had been in Stillwater, Oklahoma, since at least 1899 when he’d applied for naturalization. So he had in fact been in Stillwater long before his uncle Abraham Katz had moved from Kentucky in about 1910. And Jacob was also a merchant, according to the 1900 census. (More on Jacob and the other children of Meier Katz in posts to come.) And I kept seeing newspaper article references to Katz Department Store. At that point I decided it was time to learn more about the history of the Katz Department Stores in Oklahoma, so I did a Google search of “Katz Department Store” + Oklahoma. One of the search results was from a blog in which the blog author described herself as a member of the family that had owned the Katz Department Store in Stillwater, Oklahoma. So, of course, I wrote a comment on the blog, asking the blog owner to contact me and explaining that I thought we might be related. I knew nothing about how this woman was related to the Katz family, but I figured I had nothing to lose. Not too long after, my newly found fourth cousin, once removed, Abbi Goldenberg, responded. We exchanged a few emails and then a lovely phone conversation that covered not only family history matters, but also what it was like to grow up in the Southwest, cattle ranching, food labeling, politics, and life in general. From Abbi I learned that not only had Meier’s sons Jake and Karl come to the US, but so had all of Meier’s children, whom I will discuss in subsequent posts. As if that connection wasn’t exciting enough, I then made another cousin discovery just a few days after finding Abbi. Once again it was indirectly through a Google search. I had Googled “Abraham Katz + Oklahoma,” looking for an obituary, and one of the search results was a page from Geni.com. I am generally skeptical of Geni because no sources are cited for the trees there, but the page for Abraham had a wonderfully detailed biography that had been told to the writer by her father, who was Abraham’s grandson. I sent a message to the writer, Marsha Katz Rothplan, who was the manager of the profile on Geni, and again, within a few hours I received a response. And this is where the small world story comes into play. The response was an email I received just as I was about to go to sleep (yes, I check my phone before I go to sleep; bad, I know). Marsha was excited to be in touch, but not only because we happened to be fourth cousins. She had looked me up on Facebook and realized that I live in the area where she had once lived back in 1988. Although she had grown up in Oklahoma, she had ended up in New England after college and worked at the JCC that my family has belonged to for over thirty years. Although my eyes were drooping closed, I immediately sent her back a quick email (in fact, I was so excited that I hit “Send” too soon and sent her a three word email the first time). Chances are very good that at some time while she lived here, we met each other without ever knowing that we were related. And we know a number of people in common. To top it off, Marsha was coming to my area that very weekend from across the country, and we arranged to meet for dinner. We had a wonderful time, and she has provided me with many interesting facts, photographs, and stories about the Oklahoma Katz family. She’s also connected me to her father and to other family members who have also shared stories and information. As I now turn to the rest of story of Marsha’s great-grandfather Abraham Katz in my next few posts, I will have the benefit of the insights and photographs shared by Marsha and her family. Then just this week, I connected with yet more of my Katz cousins, descendants of Samuel Katz—more wonderful people who responded warmly and with great interest in learning about their ancestors. And one of them is close friends with the nephew of one of our close friends. 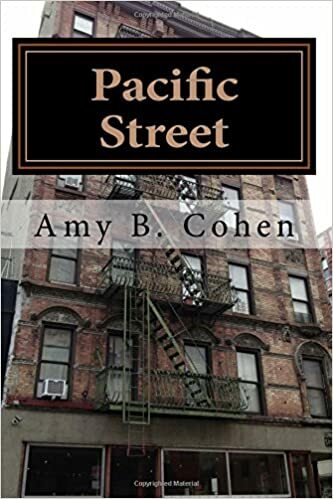 With the help of my newly-found cousins, I’ve learned not only more about my Katz relatives, but about a way of life I previously knew nothing about and once again about the reality of how interconnected we all are. I’ve also added some smart, funny, interesting, and warm women into my life. Happy Passover to all who celebrate! Remember—everyone you see or speak to may end up being connected to you in more ways than you can imagine! 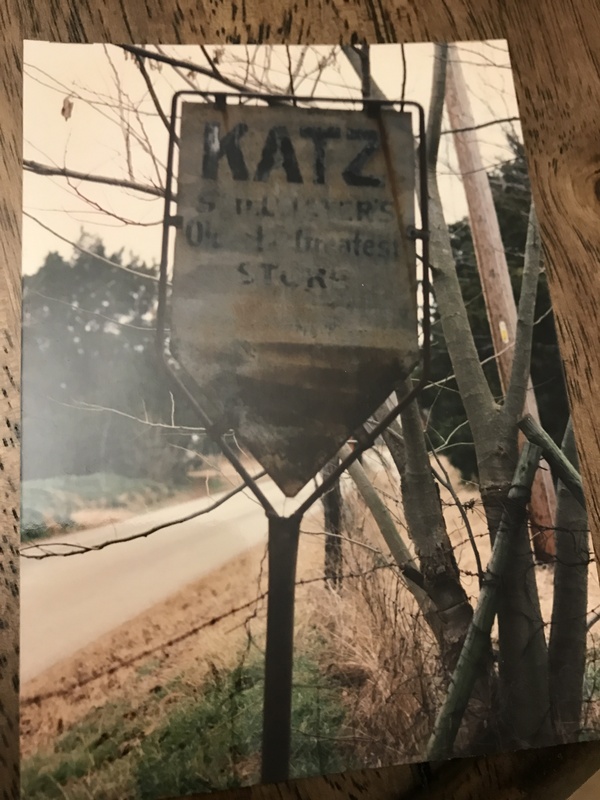 This entry was posted in Genealogy, Katzenstein, Oklahoma and tagged Katz, katzenstein, Oklahoma, Passover by Amy. Bookmark the permalink. I sent you a message. This is so funny. We are now related through marriage. I believe the ancestors are up there, guiding us along the paths to help us find each other. 🙂 What a heartwarming story and it’s great that you and Marsha were able to get together. I am still very envious of all the newspaper clues you are able to find. I like that thought! I often think of my aunt, who was our family historian, looking down and cheering me on. Great news you and Marsha found each other. This is lovely Amy; one of the great joys of researching our past is finding riches in our present. Happy Passover. You are so right, Sue. Thanks! I’m always amazed when I am able to connect with someone in an unlikely way. I connected with my third cousin when I made a comment on her mother’s on-line obituary – I never even knew this cousin existed because she was adopted so no real record linking her to my family. And we grew up living only about an hour away from each other. I’m excited to hear more about the Katz family. Thanks, Debi–I am also always amazed at the six degrees of separation phenomenon. Hope you have a great holiday also! Thank you, Sharon—have a great holiday! Amy, you are on a roll! It’s not surprising you are doing so well in the contacts department. The descendant work you do on your ancestors is amazing. Happy Passover, my friend. Oh, how I would like to be one of your cousins! Your comment about hitting “send” too soon was something I’d do, too. Makes me smile. Oh, you have found so many people. I have to say this just happened to me very recently as well and it’s hard to describe the joy to find family. The woman who found me is the wife of a real, live cousin of mine. 🙂 She put me in touch with another cousin who told me she had just met with yet another. I am quite lucky as one of these cousins lives in my home state. We are all descended from Charles and Maria Smith, but it was my posting about letters I have written in 1889 by Charles’s and Maria’s son, Alfred, that led to my cousin finding me. And on this day, eleven years ago, we lost my dad. How this all would have made him smile to know I am researching his side of the family. I think he’s guiding me. 🙂 Wonderful post, Amy. 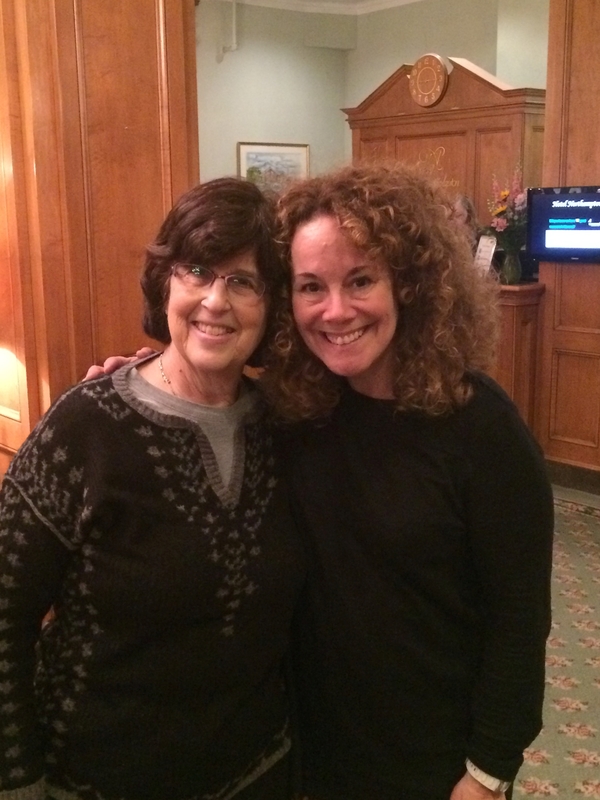 Isn’t it just magical when you find a cousin—especially one who shares your interest in family history? I am glad you’ve had such good luck. And I am sure your father would be very proud and happy that you are pursuing the history of his family. Thanks, Karen. I LOVE your blog – so many wonderful stories and you tell them so well. How lovely to have met so many cousins after making your discovery via Meier’s death registration. Looking forward to hearing more about his other descendants. Happy Passover!